Gleneagles is delighted to announce the launch of Ochil House, a unique new meeting and events space. Gleneagles has been a destination for gatherings and historic meetings since 1924 – a place of lively celebration and animated conversation. Ochil House, the latest strand of the hotel’s investment programme, will pay homage to the inventors, dreamers, pioneers and partiers who helped shape Scottish history. The design was inspired by the original private members clubs, where great minds would gather, and friendships were forged over vibrant debates, parlour games, a passion for pursuits and a love of food and drink. 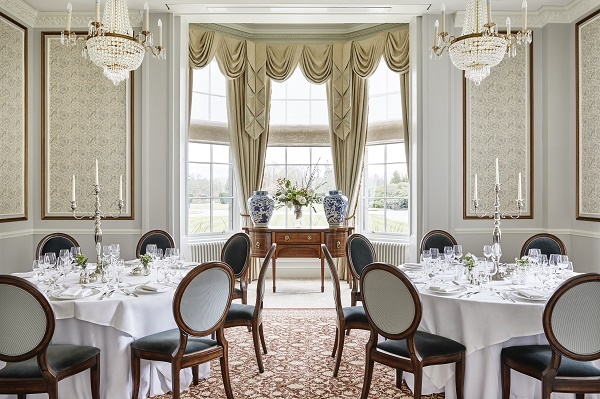 The impressive house is 380sqm in size and encompasses six beautiful rooms, each with their own distinctive flair and all named after original rooms in the hotel, including The Card Room, The Reading Room, The Writing Room and The Broadcasting Room. The space is also available to book exclusively for bespoke events, with guests able to enjoy Ochil House in its entirety. The design team behind Ochil House – Ennismore Design Studio, based at Gleneagles’ parent company, Ennismore – sourced British and French antiques and used the finest fabrics, materials and bespoke craftsmanship to blend country-house tradition with a warm, relaxed atmosphere and contemporary touches. The team also created a range of ‘inventor blue prints’ and illustrations which decorate the walls of Ochil House. These honour the great Scottish inventions and ideas – from the bicycle to the gin & tonic, from the television to the telephone, and from shortbread to the first flushing toilet – and provide talking points throughout the space, reflecting the fun and lively spirit of Ochil House. The overarching ambition of the design was to inspire, rouse ideas and stimulate conversation – encouraging guests to look around, explore and discuss, rather than sit at a table in a blank conference room. Exclusive use of Ochil House benefits from private access and beautiful outdoor breakout lawns. The individual rooms can also be booked privately to cater for both business meetings and social events. A typical day on the 850-acre estate offers an authentic Scottish experience and a glorious playground of over 50 pursuits and activities. Groups can choose from activities such as shooting and fishing to gun- dog handling and off-road driving, offering the perfect opportunity to clear the head, gain a new perspective, generate ideas and rekindle a spirit of adventure. This relaxed kitchen space is available for visiting groups using The Assembly Room or The Broadcasting Room. 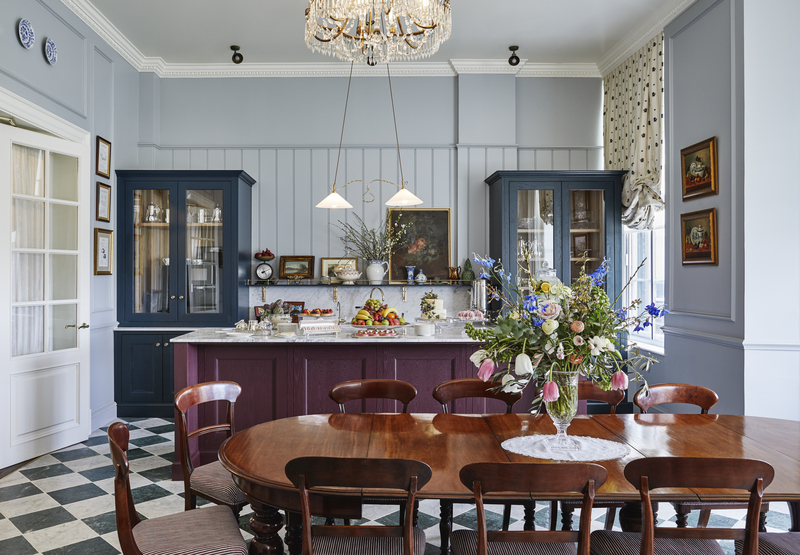 Similar to a traditional country-house pantry, with a muted blue colour palette and plenty of natural daylight, this homely and stylish break-out space provides a more informal atmosphere for guests to network around the kitchen table. Also available to book exclusively for evening events, it makes an ideal setting for casual drinks receptions, whisky or food tasting sessions. The warm and inviting atmosphere is enhanced by the collection of gathered antiques – such as traditional weighing scales, cooking utensils and antique French tureens – while a touch of elegance is created by the kitchen island in beautiful Italian feature marble; the checkerboard honed marble floor; the mahogany dining table; and the pale blue armchairs set in the bay window. 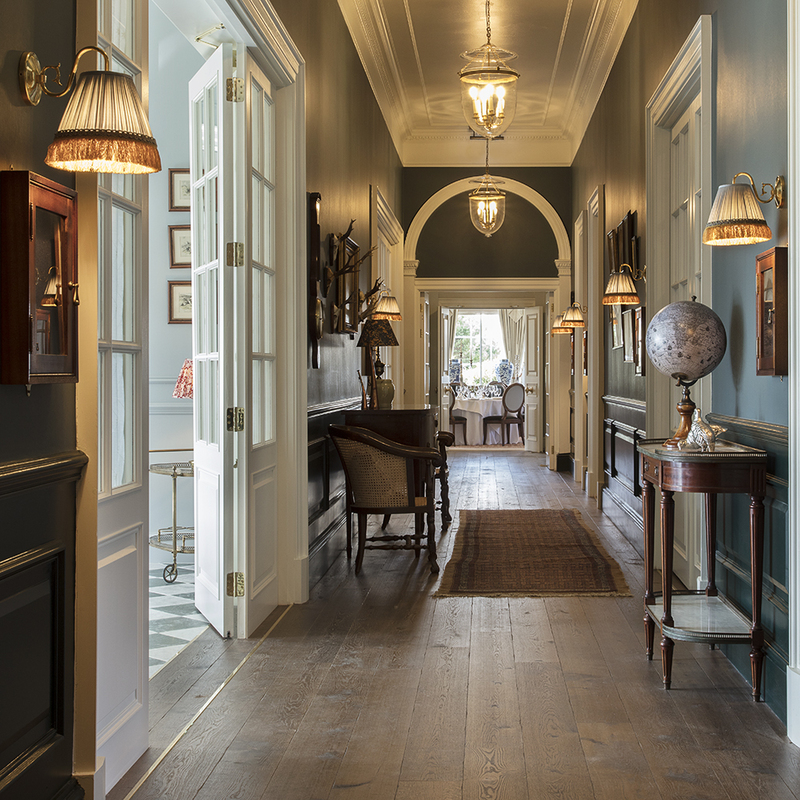 The most elegant space in Ochil House is reminiscent of a grand drawing room in a traditional country house and offers private access to the Garden Café Lawn. Overlooking the putting green and the croquet lawn, it boasts some of the best views from Gleneagles, and a south-west-facing aspect provides an abundance of natural light. Access to a private staffed bar makes it an inspiring setting for a broad range of events – from an exclusive networking event to an atmospheric candlelit supper for up to 70 guests. A light blue colour scheme provides the room with enough flexibility to enable groups to stamp their own identity on the space for any celebration or event. The wallpaper features a faded pheasant and woodland theme, in celebration of the local countryside and the hotel’s sporting heritage, while the gold painted plaster panel moulds and bespoke neo-classical style chandeliers add a sense of grandeur to the space. This is further enhanced by the room’s inspiring artwork – a range of reproductions of oil portraits of the great Scotsmen and Scotswomen whose ideas have helped shape history. With echoes of a library or smoking room within a stately Perthshire property, The Broadcasting Room takes its name from an original space within the hotel. The original broadcasting room famously transmitted Scotland’s first ever outside radio broadcast – regarded as a technical miracle at the time. The new Broadcasting Room provides a traditionally-styled and inspiring setting for boardroom meetings and intimate private dinners for up to 14 people and has direct access to The Pantry. 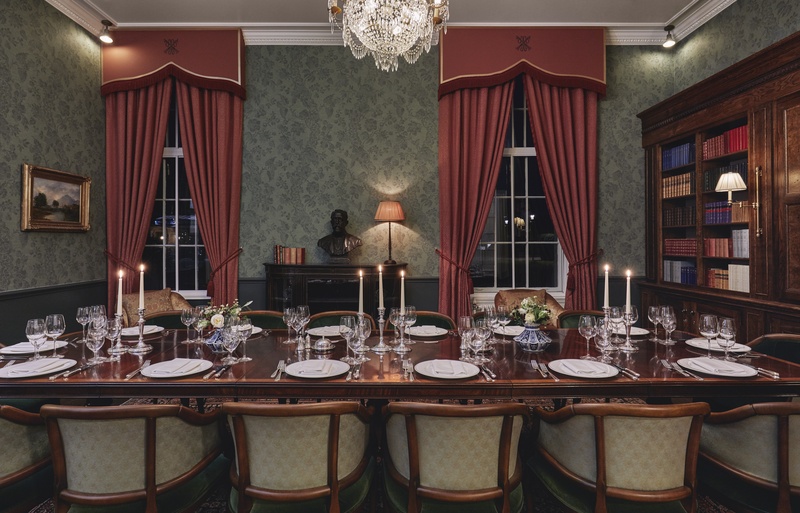 A 14ft antique Regency-style flame mahogany dining table provides a beautiful focal point, while a bespoke-designed burl inlaid bookcase, which spans the whole width of the room and is filled with antique Scottish literature, generates a stately private members club vibe. The Assembly Room is a flexible space comprising three separate rooms – The Reading Room, The Writing Room and The Card Room – for parties between 10 – 16, with partition walls that can be opened up to create one larger room accommodating groups of up to 60. Overlooking The Garden Café lawn, The Assembly Room can also be set up to provide one meeting space with one or two adjoining breakout rooms. A light colour scheme ensures the room has the flexibility to be personalised for any event, while traditional touches – including white plaster panel mould details; a Sheraton revival mahogany sideboard; Scottish antique marble base lamps; and antique French chairs which have been reupholstered in tapestry inspired fabric – fill the room with all the warmth and charm of a great country house. With views out on to The Garden Café lawn and essential AV equipment, the study is the perfect location for board meetings of up to 10 people, for presentations to a small group or for an intimate private dinner. A Hamilton Weston wallpaper design in deep rusty red and salmon pink tones, inspired by an original 1850s heritage print, gives the room a rich, intimate and opulent feel – enhanced by the 10ft antique Regency-style flame mahogany dining table.